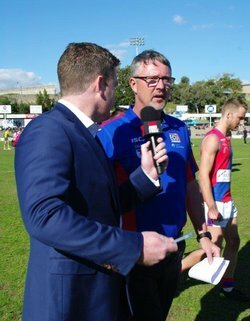 It was a beautiful day for footy at Fremantle Oval on Saturday and as a result a large crowd turned up to watch the qualifying final between West Perth and South Fremantle. The first quarter and a half was an entertaining and even contest but after this point in time the home side took control to run out ninety eight point winners. The Falcons have played consistent football all year, with only one disappointing game against East Perth during that time, but the firepower of the Bulldogs was too much for West Perth to overcome. The Falcons had the first score of the game, a behind, and this was to be the only time that they led all day. South Fremantle then kicked three majors to lead by eighteen at the fifteen minute mark. Mason Shaw and Marlion Pickett were among the goal scorers and it was just the beginning of what was to be a big day for both players. West Perth steadied to kick consecutive goals and reduce the margin to just six. Keegan Knott kicked the first of his three when he took possession at the back of the pack to finish accurately. He worked hard all day and was the Falcons most dangerous forward. Nathan Alexandre was involved when he moved the ball out of defence to get it into the hands of Andrew Strijk. “Strijky” received a free forty out and finished accurately. The Bulldogs scored the last two majors of the term and as a result led by sixteen at the first change; 5.2 (32) to 2.4 (16). South Fremantle stretched their lead to twenty two within the first minute thanks to a second goal to Marlion Pickett. His pace made him a dominant player all day. West Perth then had their best period of the day to score three quick goals. Keegan Knott scored a skilful major after marking on an acute angle. A clever kick forward by Mike Lourey enabled Keegan Knott to find space and after three bounces he skidded through his third for the day. At the ten minute mark Tyler Keitel scored from the square and as a result the Falcons trailed by just five. West Perth fans, excited at being back in the contest, would not have expected that to be the last goal scored until the seven minute mark of the fourth quarter. The Bulldogs then found another gear to kick the last four goals of the term to lead by thirty one at the main break; 10.6 (66) to 5.5 (35). It didn’t take long for any thought of a Falcons revival to disappear as South Fremantle completely controlled the third quarter to boot eight unanswered goals. 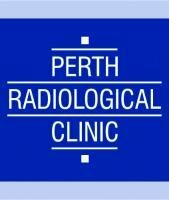 West Perth were powerless to stop the run of the South Fremantle midfield and dominance of the tall forwards and as a result trailed by eighty at the final change; 18.10 (118) to 5.8 (38). 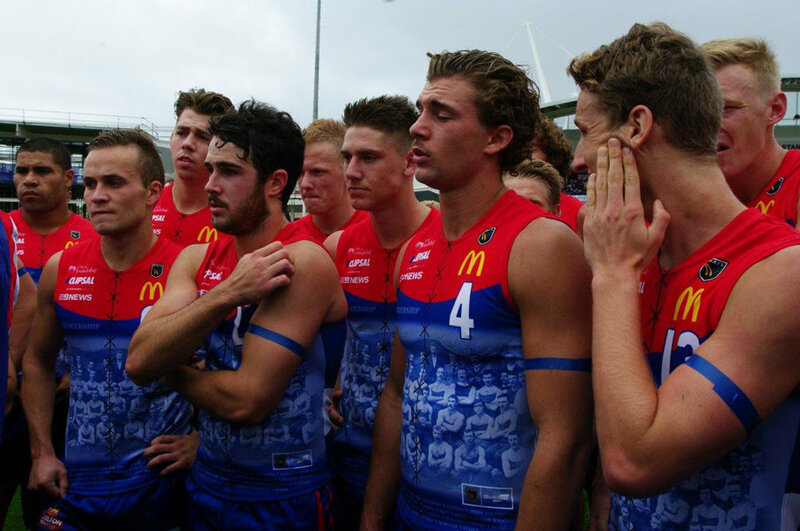 When Mason Shaw kicked his sixth at the two minute mark of the final term the Bulldogs had kicked thirteen unanswered goals. Five minutes later the run was broken courtesy of a second to Tyler Keitel after he received a pass from Andrew Strijk in the square. This was West Perth’s sixth and final goal for the game. For the rest of the quarter both teams went through the motions with an eye on next week. At the final siren Souths had scored a comprehensive ninety eight point victory; 22.12 (144) to 6.10 (46). It was the end of a disappointing day that saw the Reserves season end after a loss to Swan Districts. There are a number of players in the Reserves who are going to play a lot of League football for West Perth and they should be happy with the way that the year has gone. The League team has another chance to extend their season at home next week. Best players were hard to find but Keegan Knott posed a consistent threat. Aaron Black received a lot of attention but gave his best all day. He is a tough player and leads by example. Luke Meadows, Shane Nelson and Trent Manzone all worked hard for their possessions. Congratulations to Trent Manzone who played his 100th game. Another chance next week; be there to help get the side over the line.